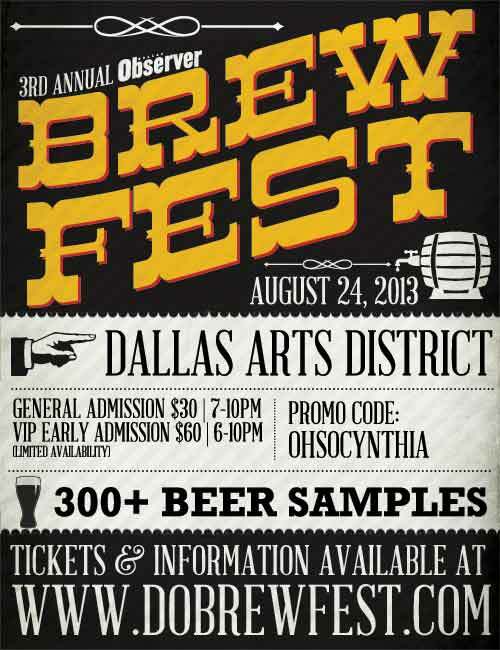 Join the Dallas Observer on Saturday, August 24th in the Dallas Arts District as they celebrate the 3rd Annual Dallas Observer BrewFest. Enjoy sampling over 200 types of beer from around the globe, while listening to live music. Use the Promo code OHSOCYNTHIA and SAVE $5 off General Admission and $10 off VIP tickets!! A $35 will get you twelve 2 oz. beer samplings, with additional sampling cards available for purchase for $2 at the event. VIP tickets are $70 and include twelve 2 oz. beer samplings from 200+ beer options PLUS Early Entry into event one hour earlier at 6:00, access to VIP Area with liquor sampling and exclusive catered food. Food will be available for purchase from: BratHaus, Chili's Bar & Grill, Hacienda on Henderson and more. A portion of the proceeds will benefit Dallas Arts District. Guests must be 21+, with a valid I.D. The festival will take place on Harwood Street between Woodall Rogers & Ross and Flora Street between Olive St & Harwood in the Dallas Arts District.